The first batch of AFG copies arrived today, sporting a colourful but temporary cover and a full set of new stuff like character creation, two combat systems, various advancement systems, achievements, spells, Holdings and MONSTROTRON, my new and revised monster generator. It’s completely cleric- and experience points-free, but still compatible with most of your OSR swag. AFG will be available in PDF, Kindle and A5 Deadtree version later on this spring. 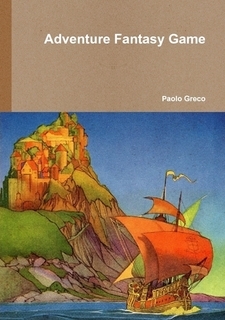 Preliminary talks with artists are promising toward showing pretty pictures both inside and on the covers. In the works, to be released any time soon (in the next weeks), the first AFG hexcrawl mini-campaign setting: Castles on the Hills, Dungeons Beneath will feature castles, dungeons and an inordinate amount of pillage and is meant to be an introduction to AFG and adventure gaming. I’ll try to be bold and experiment with the format: it’s going to be split in a free downloadable players’ introduction to both AFG and the campaign and a Referee section coming bundled in PDF and deadtree-in-your-mailbox for a handful of dollars. Brentan over at Untimately asks some interesting questions which can be summed up as “how do you roll?”. Here are the answers for AFG. Ability scores generation method? Roll 3d6 for each of three stats, in order. How are death and dying handled? if you get under 0, you might be dead. This depends on how quickly you are rescued and the blow that sent you down. If you get another hit when you’re down, you’re most most probably dead meat. What about raising the dead? Doable, but not straightforward. There are 2 NPCs in my campaign that can do it but it’s extremely hard to talk them into doing so. It happened once. Of course it’s easier and cheaper to bring back the dead as skeletons, zombies, wights and so on. How are replacement PCs handled? I’ll try to make the player play as soon as possible. My favourite tactic is “you find a prisoner, and you remember he’s an adventurer that left and never came back to the tavern”. Initiative: individual, group, or something else? Fixed order: Missile, Melee, Movement, Magic. Are there critical hits and fumbles? How do they work? They’re not there, but it’s possible to get extra damage at times. Do I get any benefits for wearing a helmet? Sure. Things falling on your head won’t kill you immediately. Can I hurt my friends if I fire into melee or do something similarly silly? Nah. Will we need to run from some encounters, or will we be able to kill everything? Of course you can kill everything, but AFG doesn’t care about how many monsters you kill. Combat brings no benefit except the possibility of having to roll a new character. Level-draining monsters: yes or no? No. Draining monsters heal themselves, then increase their maximum hits after they are fully healed. Are there going to be cases where a failed save results in PC death? Of course my dear. And in many other cases a failed save might kill you indirectly. How strictly are encumbrance & resources tracked? Resources very strictly. Encumbrance not really, but armour will make you slow, thus unable to run away as quickly. What’s required when my PC gains a level? Training? Do I get new spells automatically? Can it happen in the middle of an adventure, or do I have to wait for down time? You can gain a level or any other achievement benefit at any point, no training needed. But PCs can also train and research: in addition to spell research for Casters AFG offers Fighters rules to develop, teach and learn Secret Weapon Techniques. What do I get experience for? There’ be no experience points in AFG, characters grow by doing stuff and looting treasures, like Sham ordered. And the stuff to be done depends on both the campaign and what you agreed with the Referee. Also practising tasks makes you earn EXPERT letters. When you accumulate the sixth on a task, you become, guess what?, EXPERT at it. You can also become MASTER later, for added bad-assery. How are traps located? Description, dice rolling, or some combination? Description, but if you prowl slow enough you might just notice them. The problem is that you’ll keep on running into them nasties. Are retainers encouraged and how does morale work? Yes, but morale does not have hard-and-fast rules yet. There are spells to make wimpy minions go back to the front line tho. How do I identify magic items? Unveil Arcana is known by all level 1 Casters, unless the player decides so. Can I buy magic items? Oh, come on: how about just potions? Sure. You can also buy a kingdom with enough gold. Potions are not that common, but you can easily get mana vessels and fetishes for level 0 spells, so you can cast your own spells. Can I create magic items? When and how? You need to progress as Caster a bit, but you’ll be able to make minor magic items such as fetishes and mana vessels soon. For magic swords and the like, it’s definitely doable, but I’d rather find an enchanted anvil or some meteoric ore.
What about splitting the party? Sure. When you run away and leave your mates back you might even survive. Yes, done. Not complete or perfect, just done. 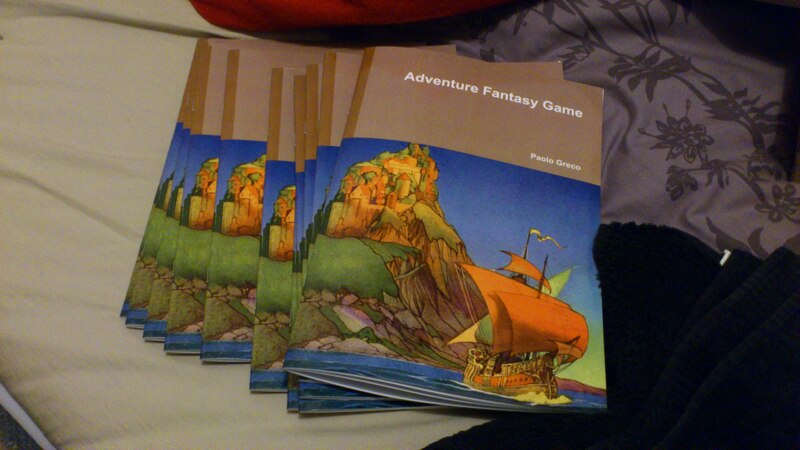 I wanted to have some early version copies before my spring trip to see family in Milan and I wanted some copies to give to my players there. My plane is next wednesday so I wanted to send the copies before thursday start of business hours. But the book was a mess. The holdings chapter needed a monster generator and treasure tables, no rules for teaching and for development of Secret Weapon Techniques, lots of spells still missing, sparse illustrations, not many notes on how to create a campaign and run a sandbox/pointcrawl/megadungeon. But I had enough feedback and momentum, and I’ve been developing the system for the past year or so. Play a bit, ask for feedback, tweak the rules, play a it more, ask for feedback, tweak, lather, rinse, repeat. Repeat. Repeat a bit more. Do math to verify that, no, the system it’s not going to break in weird places. Play again, endure the spells when you can’t muster enough players, enjoy when you can, be thrilled when players rediscover the thrill of adventure gaming and are forced to make hard, interesting decisions. At some point stop working on it because, hey, if I deliver it people might not like it. So a while ago I kind of froze. Post-postgrad school depression and dissertation burnout really knocked me out for a few months. Then play it a bit more to realize that, despite still very rough on some edges, testers really like it. And that making expensive armours and firearms available makes financing critical from level 1. So in the past few days I just went into “software project management” mode and cut features from the first release. No religion chapter, no example dungeon or setting, keep the magical items to the bare AFG essentials. Cut the unfinished spells and campaign development notes. Add the illos you have to get in, and don’t worry if they don’t look perfect. Stop freaking out about typos, bad grammar and remember that, while a couple of sections might not have been perfectly proofread, proofreaders have done a good jobs of being nitpickers. Then discover that you’ve written a game stat-compatible with most OSR material without using any non-original game mechanic (except stuff written by Sham). That you’ve done away with experience points, spell memorization, the way combat works, clerics, the pain of single-classing and the meh of multiclassing. You’ve written 30 original spells, new magic item concepts, completely new combat rules and that, since the whole manual has been made through clean room development, it’s OGL-free. Because I want people to play the Original Fantasy Adventure Game and I don’t think that it needs to rely on specific rules, giant fire-breathing flying monsters or underground fortifications, much less on the good will of WotC. This early morning at half past five I sent the final revised file to Lulu. Some parts are terrible, some are good, some need more work. But it’s done. Done is the drug that makes you feel Great, Done is the ingredient to More.